Tsinghua Holdings Co Ltd is actively developing the fields of nuclear energy, solar energy, clean coal, and treatment of waste water, air, and water-borne solid waste. It aims to be an influential global supplier of energy and environmental protection solutions and services. ● Tsinghua Holdings nuclear energy group is devoted to advancing the industrialization of high-temperature gas-cooled reactors and low-temperature heating reactors, and to constructing the first fourth-generation nuclear system modular high-temperature gas-cooled reactor power station in the world. ● Chengzhi (Nanjing) Clean Energy Co Ltd is a role model in China for its energy conservation, emission reduction and development of the recycling economy. It aims to boost the clean usage of coal, and is a proprietor of mature clean coal technology. ● Tus-Clean Energy Co Ltd is the industrial founder, driverand standard-setter of the Chinese solar thermal utilization industry. It originally created all-glass coating-covered vacuum tubes used in solar water heaters, and set up the first automatic production line for heat-collecting tubes in the world. ● Tus-Sound Environmental Resources Co Ltd has a complete industrial chain for solid waste treatment that offers one-stop services and overall environmental protection solutions. ● Tsinghua Tongfang Artificial Environment Co Ltd has a complete energy conservation integration industrial chain in China. It has built heat pump projects as large as 300 million square meters across the country which helped save 3.1 million tons of standard coal and 9 billion kilowatt hours, and cut emission of carbon dioxide by 8.05 million tons. 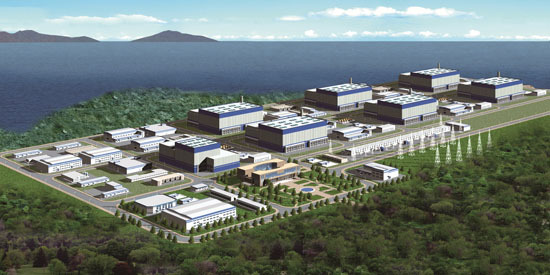 This high-temperature gas-cooled reactor module demonstration project in a 200MW nuclear power unit of Huaneng Shandong Shidao Bay Nuclear Power Co Ltd is the first of its kind in the world. Zhejiang Huaneng Yuhuan Power Plant, the first flue gas desulfurization 2*1000MW ultra supercritical coal-fired power generation unit in China. Ecological restoration project of Wuhan Jinkou Wasteyard's Landfill, the largest ecological landfill restoration project in the world.